It’s been a while, huh? In the meantime, I’ve gone paleo, which seems extremely limiting but has done worlds of good for me. My fibromyalgia is in remission (if I was even correctly diagnosed in the first place), I’m off one inhaler & tapering down other drugs, and I feel amazing! Energetic, sleeping more soundly than I have in over a decade…I could go on and on but I won’t. As a consequence, I’m having reactions to soy and corn. Oh well – it’s still a good trade. Sunday’s I cook up a storm – usually at least one of the slow cookers are going (I never use the word Crockpot – besides, mine are Hamilton Beach) and I’ve got something in the oven. This stew is at least 6 servings, depending on the amount of meat you use (and we’re hearty eaters). It freezes well and tastes just as good on subsequent days. Put the kale into the bottom of the slow cooker. Cut the beef into large pieces (I usually cut it into 6 – if you cut it into more, you’ll probably want to decrease the cooking time a bit. Spoon tomato paste on top of beef, and sprinkle the garlic cloves around the pieces. Put the rest of the ingredients into the slow cooker. Lid it and cook on low for 8-9 hours. If you’re freezing some of it in individual servings, make sure you get a garlic clove or two in each container. Thanks, Doug, though I think the quality of a picture improves proportionately by the amount of hunger you have! I made this the other night instead of my usual beef stew. I found your recipe via google as I had some kale I wanted to try and incorporate. 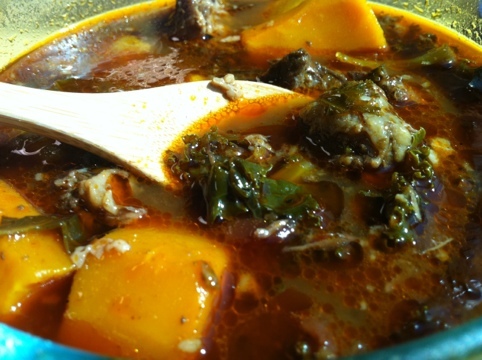 This stew is SO good- thank you for the recipe! Hey thanks so much for posting this. I made it this morning and the smell of the slow cooker all day made me sooooo hungry! It was so yummy and easy to make. I was expecting it to taste a little more bland but all the veggies made the broth really good. Thanks very much for posting. 5 stars! sounds wonderful! looks even better. Im still trying to find a butcher that sells grass fed meat. I will make it this week. btw, soy sauce has gluten in it! Actually, not all soy sauces contain gluten. I know Kikkoman has a gluten-free soy sauce. Before going paleo, I used San-J organic tamari sauce, but now I use the coconut aminos with my newly-obtained sensitivity to soy. Also, there are a couple of online sources for grass-fed beef – U.S. Wellness and Tropical Traditions. You may find some success finding a producer in your location at Eat Wild. Good luck! I’ve got this in the crockpot right now. The picture doesn’t really look that appetizing to me as it looks so greasy, but I’ve got some good local, organic, grass fed beef that is delicious. I added a lot of vegetables and some homemade beef broth. I think it will be quite good. The picture actually didn’t appeal to me because it looked a bit greasy, but I was looking for a paleo slow cooker recipe to use up some of the good local, organic, and grass fed beef I have in the freezer. I added a lot of vegetables, and I used San-J organic tamari. I also used homemade beef broth. This recipe is delicious! Don’t be turned off by the picture and that it might look too greasy to some – it totally depends on your cut of beef. This is probably one of the best beef stews I’ve made! It would totally pass the taste test for your non-paleo friends. By the way, I look up many a recipe online but this if the first one I’ve felt compelled to write feedback. Yum! We tried this recipe yesterday – delicious! I eat paleo, but my hubby eats everything. He was happy as could be dipping pan rustica into the yummy broth. Thanks so much for sharing it. Thanks! I’m on an scd diet and feeling lazy.. And had some kale. I only have lean beef so we’ll see how it goes! I think lean beef will be fine! Enjoy! Yes! Finally something about elocution.